Yet, for all the angst and repression in this music, there are clear signs of a composer able to explore some of the previously outlawed techniques of Western avant-gardism. With Stalin’s death and Khrushchev’s jaw-dropping denunciation of the cult of personality, Soviet life experienced a wave of relaxation. In the musical world this coincided with the emergence of two significant but long forgotten figures who would kick-start the second Soviet avant-garde: Philip Gershkovich and Andrei Volkonsky, both of whom moved to Moscow in the mid-1940s. Gershkovich, although never officially employed at any music school or conservatoire, went on to be the single most influential teacher of composers, performers and musicologists. His pupils included Schnittke, Denisov, Gubaidulina, Yuri Kholopov, Gidon Kremer and many more, all of whom sought his counsel because of his direct links with the Second Viennese School: he had been a pupil of Berg and Webern, and a conducting student of Hermann Scherchen. If Gershkovich offered a pedagogical link to the lost world of Western experimentalism (at least of the early twentieth century), then Volkonsky provided scores and recordings through which Soviet musicians could learn this music; he also offered, in 1956, Russia’s first serial work, aptly titled Musica Stricta, which paved the way for a generation of young, experimental composers. “with this work Shostakovich is close to us once more, one of the family, one of us”. Shostakovich received a great deal of attention in 1966, the year of his sixtieth birthday. This was also the year of his first heart attack and his health hardly improved into 1967. It was in this year that the composer would witness the première of his Second Violin Concerto and his obligatory offering to the fiftieth anniversary of the revolution, October. His son, Maxim, had just graduated from the Moscow Conservatoire conducting course and was keen to première the Concerto. Rather against his fatherly instincts, Shostakovich appreciated the need to entrust such an important première to an experienced conductor. To placate the disappointed Maxim, the composer offered his son the October première – a fact that illustrates the relative value he ascribed to this work. October was completed by 10 August 1967 and premièred in the Moscow Conservatoire a month later on 16 September. In early September Shostakovich broke his right leg, leaving him hospitalised and bed-ridden. He was therefore unable to attend the rehearsals and listened to the première on the radio. The work constitutes a substitution for the long-promised, and never-to-be-delivered, Soviet opera “The Quiet Don”. As a tribute to the anniversary celebrations, it demonstrates signs of regression. The musical language is at some remove from the dark, increasingly rarefied character of the surrounding works such as the Second Cello and Violin Concerti. Rather, the composer seems to have reverted to the language of the Tenth Symphony of some 15 years earlier. The opening motive recalls the beginning of both the first and third movements of the Tenth, and the three-note anapaestic rhythm that introduces the DSCH monogram in the symphony becomes increasingly prominent. If these works draw from the same musico-linguistic well, the same cannot be said for the relative quality of thematic design and coherence, in which October is much the poorer. Shostakovich described the moment in which he finally conceived of the work: during a screening of the soon-to-be re-released film Volochayev Days, for which he wrote the score some thirty years earlier, the composer re-discovered his pride in the “Partisan Song”. In that instant he decided to build his symphonic poem around this melody, which appears in October as the second theme (fig. 27 for those with a score), introduced by the clarinets. It certainly is a fine melody, firmly set in what Shostakovich would have called his style russe. The work, it is fair to say, has enjoyed limited success and a good deal of derision. Whether it really is worse than the anodyne Song of the Forest is a moot point. If nothing else, this performance gives us the opportunity of hearing an “official” work written at the time his late style was beginning to develop. It is interesting to note his regression to the language of the Tenth Symphony – a point that suggests a number of things, not least that by 1967 the Symphony was fully integrated and accepted into Soviet musical society, no longer associated with the heated Composer’s Union debates at the time of its première. By 1967, Soviet music had clearly moved on, as had Shostakovich. 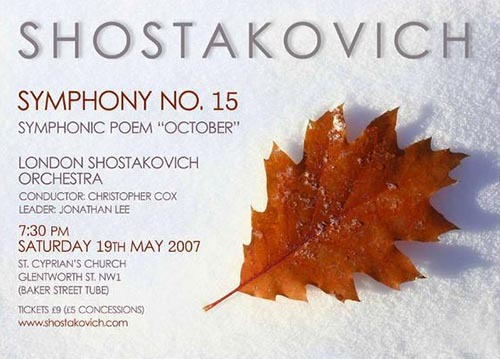 If Maxim was too inexperienced to première October, it took him little more than four years to convince his father of his worth, for in January 1972 Maxim gave the first performance of Shostakovich’s last and in many ways most enigmatic symphony, the Fifteenth. This work represents not an apotheosis of one of the twentieth century’s greatest symphonic catalogues, but a complex of paradoxes and riddles that has baffled audiences and critics from the first performance onwards. This statement suggests either that Shostakovich was not interested in answering the question, or that for him quotation was more an act of his stream-of-consciousness than a deliberately pre-conceived action. Either way we, as the audience, must recognise two things: (1) these quotations are not simply musical tricks but rather suggest a deeper, more complex motivation; and (2) that we may never fully come to understand the details of this deeper motivation. However, he did offer some clue as to the first movement, which he likened to a toy shop scene, although, as one Soviet critic at the time observed, if this is a toy shop it is one that has been locked up for the night and whose toys are inclined to mutiny against the tyrannical shop owner. The work was written during the summer of 1971. Shostakovich composed the first movement while receiving treatment at the Kurgan clinic of the famous Dr Ilizarov in June. He spent the month of July at an artists’ retreat in Repino where he continued to work on the Symphony, completing it on 29 July, just before his return to Moscow. The première was arranged for early October, but a second heart attack and the consequent period of recuperation led to the performance being postponed until 8 January 1972. By this time, Shostakovich had recovered his health enough to attend all rehearsals – something he was in the habit of doing, but perhaps more so this time because this would be the first major première he had entrusted to his son. In the event, the performance was a success and the work enjoyed the same reception in Leningrad under Mravinsky, after which it moved westward into Europe and the US, often with Maxim at the helm. Whether Shostakovich would have agreed with this statement is a moot point; it is certainly at some remove from what we would consider the fundamental features of his late style – the preoccupation with death and the fragility of his own mortality. The inexorable passing of time represented in the closing pages of the Symphony has become a defining feature of late Shostakovich and might therefore suggest at best a temporary aberration in the composer’s “belief in man’s inexhaustible strength”. On the other hand, perhaps Khrennikov didn’t stay to hear the end!